Stewart Haas racing won the Owners' Championship, while Tony Stewart, co-owner of Stewart-Haas Racing with Gene and Margaret, won the Drivers' Championship with a victory at the final race of the season in a tiebreak over Carl Edwards. Chevrolet won the Manufacturers' Championship with 248 points. There were 41 full-time teams in 2011. In preparation for 2011, Penske Racing made team changes by moving Brad Keselowski, along with his No. 12 team, into the No. 2 Miller Lite car, replacing Kurt Busch and his 2010 team, who moved to the newly formed No. 22 Shell/Pennzoil car. Another change was made by Hendrick Motorsports, who rearranged three of the four-car team. The team moved Steve Letarte with Dale Earnhardt, Jr., Alan Gustafson with Jeff Gordon, and Lance McGrew with Mark Martin. On January 7, 2011, Bob Leavine and Lance Fenton announced the formation of Leavine Fenton Racing, and that David Starr drove for the team. In February, another team was formed, FAS Lane Racing, by Frank Stoddard. 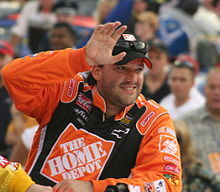 In March, David Stremme announced his return to the Cup Series with a new team, Inception Motorsports. They ran the No.30 Chevrolet and attempted to make the Crown Royal Presents the Matthew and Daniel Hansen 400 at Richmond. In October before the Bank of America 500, it was announced that Sinica Motorsports would join the Cup Series for 3 races in 2011, running the No. 93 Chevrolet with either Bill Elliott or Terry Labonte and that ARCA driver Grant Enfinger would drive for the team for 10-15 races in 2012. Several drivers changed teams for the season. One of which was Paul Menard, who left Richard Petty Motorsports to drive for Richard Childress Racing. Menard signed a three-year deal to expire at the end of 2013, with options for further years. Other changes were Kasey Kahne who joined the Red Bull Racing Team, after leaving Richard Petty Motorsports in 2010, and Marcos Ambrose who left JTG Daugherty Racing to drive for Richard Petty Motorsports in 2011, as a replacement for Kahne. Also, Bobby Labonte replaced Ambrose at JTG Daugherty Racing, and Bill Elliott, who moved from Wood Brothers Racing to Phoenix Racing. Kevin Conway, the 2010 NASCAR Rookie of the Year in the Sprint Cup Series, also made a change by moving to NEMCO Motorsports. For the 2011 season, Trevor Bayne, who placed seventh in the 2010 NASCAR Nationwide Series season, entered the series driving for Wood Brothers Racing in 17 scheduled races. Another driver, Brian Keselowski also entered the series, after qualifying for the 2011 Daytona 500 for the K-Automotive Motorsports team. Some drivers left the series, such as Elliott Sadler who left Richard Petty Motorsports to drive for Kevin Harvick Incorporated in the Camping World Truck Series and Nationwide Series. Sam Hornish, Jr. also exited the series and moved to the Nationwide Series to participate in ten races, after new sponsorship for his Sprint Cup Series car could not be found. After the final race of the 2010 season, Scott Speed exited the series after Red Bull Racing Team dismissed him to make room for Kahne. The change resulted in Speed filing a lawsuit against the team for several reasons. During July 2011, Max Q Motorsports announced that Scott Speed signed a three race contract with the team to race at Indianapolis Motor Speedway, Watkins Glen International and Pocono Raceway. Following the announcement, Speed commented, "I am excited to get back to the track. Max Q Motorsports seems to have a good operation and a great group of guys. Ford has a great engine package, so I'm hopeful that we can get the ball rolling quickly and be competitive out the gate. " At the beginning of the season, two drivers announced plans to participate in the 2011 Rookie of the Year standings. The drivers were Andy Lally driving for Kevin Buckler's TRG Motorsports, and Brian Keselowski, moving his family-operated K-Automotive Motorsports team up from the Nationwide Series. Trevor Bayne, who was running half the season with the Wood Brothers, did not participate in the standings after deciding to participate for the Nationwide Series championship. T. J. Bell entered later in the season and collected his first Cup points at Pocono. As Lally was the only rookie driver to run the required 17 races to keep eligibility, he won the rookie award easily despite being released from TRG before Homestead. After the 2010 season, the catch can man, who caught excess fuel during pit stops and adjusts the track bar, is no longer needed, because of the addition of a self-venting fuel can. On January 11, 2011, NASCAR reported drivers can only be able to compete for the championship in one of NASCAR's three national racing series, which means the drivers who race in multiple series, most notably in the Cup and Nationwide Series, are able to compete in the races, but not for the championship. The rule does not affect the exemption rule, as exemptions are determined by the top 35 in NASCAR car owner points. Drivers ineligible for Sprint Cup driver points earned Sprint Cup owner points for their team. An announcement came on January 26, 2011, when Brian France announced that the winner of the race, excluding bonus points would receive 43 points, and each position lost one point from the position before, so that the first position would receive 43 points, while second would receive 42. For bonus points, if the driver leads a lap they receive one, if they lead the most laps they receive one more, and if they win the race they receive three more points. On the same day, France announced changes to the qualifying format, such as the qualifying order being set by practice speeds from slowest to highest. If qualifying is canceled, the grid would be determined by practice speeds, unless they are also cancelled, then they lined up by Drivers' points. In the press conference, it was also noted that in the Chase for the Sprint Cup, the eleventh and twelfth positions would be awarded to whoever has the most victories who are ranked from 11th to 20th in regular-season driver's points. Those drivers would not be given bonus points for wins. In addition, the number of base points received by Chase drivers at the points reset were set at 2,000 instead of the previous 5,000. During the 2010 season through the off-season, NASCAR announced a change to the front end of the race cars. The change removed the splitter braces, and made it a single molded piece. The fuel for all major series in NASCAR changed from Sunoco unleaded to an ethanol blend called 'Sunoco Green E15'. But during the rest of the season on August 23, Toyota unveiled the new Camry at Paramount Studios, Hollywood, California and the teams changed their headlights, taillights, fog lights, and rear for the rest of the season. On August 18, 2010, the final calendar was released containing 36 races, with the addition of two exhibition races. The schedule also includes two Gatorade Duels, which are the qualifying races for the Daytona 500. ^1 race was postponed due to rain. For the 2011 season, NASCAR made several changes to the schedule. One change was that the Subway Fresh Fit 600, held at Phoenix International Raceway, was reduced to 500 kilometers, making the name Subway Fresh Fit 500, and it became the second race of the season. Also the Kobalt Tools 500, held at Atlanta Motor Speedway, was discontinued. The Auto Club 500 at Auto Club Speedway, was reduced to 400 miles making the name Auto Club 400, and became the fifth race of the season. More changes to the schedule included Kansas Speedway gaining a race (the STP 400), which was run on June 5, 2011, and Kentucky Speedway hosted its first Sprint Cup Series race, the Quaker State 400 on July 9, 2011. The Chase schedule was changed to the GEICO 400 becoming the first race in the Chase for the Sprint Cup; the Sylvania 300 at New Hampshire Motor Speedway was the second, while Auto Club Speedway's Pepsi Max 400 was removed. Another change for the season involves the races in the Chase for the Sprint Cup, which had different starting times so they would not conflict with the beginning of NFL games. The change was made after seven races during the 2010 season began at 1:00 pm EST, the same time as the NFL games began. The change delayed the start of the first six races, excluding Charlotte, to 2:00 pm EDT, while the last three started at 3:00 pm EST. Charlotte Motor Speedway's race remained on Saturday night. Martinsville Speedway's October race on Halloween weekend features a 1:30 pm EDT start because the track does not carry lights, and as a result is using the 2004-09 start time of 1:30 pm EDT. The new front end (shown here on Trevor Bayne's car prior to the 2011 Daytona 500 at Daytona International Speedway) that was being used during the season. The preseason testing season began on January 20, 2011, with a three-day test at the Daytona International Speedway to test the new nose on the car, as well as the new surface. Also in the sessions, the opening of the restrictor plate was reduced from the 30/32 inch plate used in tire testing in December to 29/32 inch. NASCAR vice president for competition Robin Pemberton stated, "We'll have to get back and talk to the teams and look at the speeds from the last two days of testing. I think we have some high-water marks at 197-and-a-half which, depending on where they pulled up in the draft, it may be a little quick, but it's hard to say." During the first session on the morning of January 20, 2011, 33 drivers participated, and Clint Bowyer was quickest with a speed of 184.216 mph while David Reutimann had the highest speed of 195.780 mph during the second session in the afternoon. The third test session, scheduled for the morning of January 21, was canceled because of wet weather. During the fourth session, held during the afternoon, 34 drivers participated with Denny Hamlin being quickest with a speed of 196.868 mph. Several drivers decided to leave after the session, which included Reutimann, Martin Truex, Jr., Jimmie Johnson, and Bowyer. During the fifth session, held on the morning of January 22, 29 drivers participated, and Joey Logano was quickest with a speed of 197.516 mph. Brad Keselowski was quickest with a speed of 198.605 mph in the final session. Once the testing concluded, NASCAR managing director of competition John Darby commented that he did not expect to change the restrictor plate that they used in the January test sessions, leaving the opening at 29/32 inches. In the first exhibition race of the season, the 2011 Budweiser Shootout, Hamlin crossed the finished line in the first position, but since he passed below the yellow out of bounds line, Kurt Busch became the winner of the race. Trevor Bayne won the opening race of the season in the Daytona 500 after David Ragan received a penalty for a restart violation, with Bayne becoming just the fifth driver to win the race for Wood Brothers Racing and the youngest ever to win the Daytona 500 at 20 years and 1 day, as well as the first driver to win the race (excluding the inaugural 1959 race) in his first Daytona 500 start. Four-time champion, Jeff Gordon claimed victory in the 2011 Subway Fresh Fit 500 at Phoenix International Raceway, after leading the most laps of 138, ending a 66-race winless streak. Next, Carl Edwards won the 2011 Kobalt Tools 400 after Tony Stewart, who led the most laps, was penalized on pit road. After winning the Nationwide race on Saturday, Kyle Busch held off Carl Edwards and Jimmie Johnson to take his fifth consecutive Bristol victory. Though Kyle dominated the race, Jimmie Johnson took the lead briefly but was passed on the last lap by Kevin Harvick, who took his first win of 2011 at Auto Club Speedway. The following week, Harvick passed fan favorite Dale Earnhardt, Jr. with four laps to go to win at Martinsville Speedway. Roush Fenway Racing dominated the weekend at Texas Motor Speedway, with Matt Kenseth leading 169 laps en route to his first victory in 76 races. In the Aaron's 499 Jimmie Johnson edged Clint Bowyer for the win at Talladega Superspeedway by .002 seconds, tying the closest finish in series history. For the third consecutive season, Kyle Busch dominated the spring race at Richmond, leading 293 of 400 laps en route to his second win of the season After being denied victory at Talladega in 2008, Regan Smith stayed out on older tires and held of points leader Carl Edwards for his and Furniture Row Racing's first Cup Series victory at Darlington Raceway. Making a last minute two-tire pit stop on the final pit stop, Matt Kenseth outran former teammate Mark Martin to take his second win of the season at Dover. At the second exhibition race of the season, the NASCAR Sprint All-Star Race XXVII at Charlotte Motor Speedway, David Ragan and Brad Keselowski finished 1–2 in the Sprint Showdown, while fan favorite Dale Earnhardt, Jr. won the fan vote to transfer into the main event. Carl Edwards dominated the final two segments and held off Kyle Busch for his first All-Star victory. With the teams remaining in Charlotte for the Coca-Cola 600, Dale Earnhardt, Jr. came close to snapping his winless drought by gambling on fuel, but ran out of gas on the backstretch, allowing Kevin Harvick to drive to his 3rd win of 2011. At 402 laps and 603 miles, the race was the longest in NASCAR history. At the inaugural STP 400 at Kansas Speedway, a dominant Kurt Busch was forced to stop for fuel with 7 laps to go, allowing teammate Brad Keselowski to take the lead and hold off a charging Dale Earnhardt, Jr. for his second Sprint Cup victory. At the 5-hour Energy 500, a quick final pit stop enabled Jeff Gordon to beat polesitter Kurt Busch out of the pits, getting Gordon his 84th Sprint Cup victory, tying Bobby Allison and Darrell Waltrip for third on the all-time wins list and also tying Waltrip for the most wins in NASCAR's modern era. The next week at Michigan, defending race winner Denny Hamlin got an excellent final pit stop, enabling him to hold off Matt Kenseth for his first win of the season. The next week at Infineon Raceway, Kurt Busch dominated the race and easily held off Jeff Gordon for his first win of 2011 and first on a road course. The series returned to Daytona for the Independence Day weekend. Daytona 500 winner Trevor Bayne crashed out early, and David Ragan with help from teammate Matt Kenseth, rebounded from his late 500 loss to take his first Sprint Cup victory. The following week, at the inaugural Quaker State 400 at Kentucky Speedway, Kyle Busch dominated the race and held off a hard charging David Reutimann for his third win of the season. Heading up to New England for the Lenox Industrial Tools 301 at Loudon, Ryan Newman and Tony Stewart, both drivers for Stewart Haas Racing started first and second on the grid, and the two remained in the same order at the conclusion of the race, Newman's his first win of season. After an off week, the series made its way to the prestigious Indianapolis Motor Speedway for the Brickyard 400. Though Jeff Gordon had the dominant car, pit strategy got Paul Menard out front and eventually hold off a hard-charging Gordon for his first career Sprint Cup victory. The series returned to Pocono for the Good Sam RV Insurance 500. The Joe Gibbs Racing trio of Denny Hamlin, Kyle Busch, and Joey Logano dominated the race, but Brad Keselowski, racing injured from a crash at Road Atlanta, held off Busch with 10 to go to take his second win of the year. The next week at Watkins Glen, Cup drivers returned to road course racing, and Marcos Ambrose held off Brad Keselowski and Kyle Busch in a green-white-checker finish and avoided several violent crashes, including David Reutimann flipping in the esses on the final lap, to claim his first Sprint Cup Series win, becoming the fifth first-time winner in 2011. Ambrose also became the first Australian ever (and fourth foreign-born driver) to win a Cup Series race. The series returned to Michigan for the Pure Michigan 400, and Kyle Busch would dominate the race and hold off Jimmie Johnson for his fourth win of 2011. Heading to Bristol for the Irwin Tools Night Race, Jeff Gordon and Matt Kenseth dominated the race, but Brad Keselowski got out front after a fast final pitstop and held off Martin Truex, Jr. for his third win of 2011. Heading to Atlanta Motor Speedway for the Labor Day weekend, the race was pushed to Tuesday September 6 due to Tropical Storm Lee dumping rain on the Southwest Sunday and Monday. When the race resumed, Jeff Gordon held off Hendrick Motorsports teammate Jimmie Johnson for his 3rd win of 2011 and his 85th overall win in the Cup Series. At the Wonderful Pistachios 400, the last race of the regular season was hotly contested with multiple drivers needing a win to break into the Chase. Kevin Harvick would end up holding off the field for his 4th win of 2011 while Denny Hamlin and Brad Keselowski completed the two wild card spots in the top 12. For the first time, Chicagoland Speedway was the site of the Chase opener. With the race delayed until Monday due to rain, Tony Stewart held off a hard-charging Kevin Harvick and outlasted the field on fuel to take his first win of 2011. The teams headed up north to return to New Hampshire Motor Speedway for the Sylvania 300. Once again, the race came down to fuel mileage as Tony Stewart passed Clint Bowyer with 2 laps to go and held on for his second consecutive win of the year. In the series' return to Dover, Jimmie Johnson dominated the race, but Kurt Busch took advantage of a restart and held off Johnson for his second win of 2011. Heading to Kansas, Jimmie Johnson once again dominated the race, but sealed up his second win of the season on a Green-white-checkered finish by holding off Kasey Kahne. Clint Bowyer, shown here before the Coca-Cola 600, claimed his only victory of the season in the Good Sam Club 500 at Talladega. The series returned to Charlotte for the halfway mark of the Chase. Kyle Busch dominated the race, but Matt Kenseth passed Busch late in the race and held him off for his third win of 2011. During the Good Sam Club 500 at Talladega, the controversial two-car draft dominated the race, as the RCR duo of Jeff Burton and Clint Bowyer pulled away from the field on a late restart, though Bowyer would pass Burton on the final lap and beat him to the line by a fender for his second consecutive fall Talladega win. The teams returned to Martinsville for the final short track of the season. There, the Chase drivers had up and down days, but Tony Stewart passed Jimmie Johnson on the final restart to grab his third win of 2011 and keep his Chase hopes alive. Returning to Texas, Stewart dominated and passed a gambling Jeff Burton with 5 to go to hold off points leader Carl Edwards for his fourth win in 2011. At the penultimate race in Phoenix, the drivers face a completely new Phoenix International Raceway. Stewart dominated once again, but Kasey Kahne held off a hard-charging Carl Edwards to snap an 81 race winless streak. At the season finale, championship contenders Edwards and Stewart dominated the race with a razor-thin points gap, but Stewart prevailed and took home both his fifth win of 2011 and defeated Edwards for his first Cup championship as an owner-driver (Stewart and Edwards were tied in points after the race; Stewart prevailed on the first tie-breaker, number of race wins during the season – Stewart had five wins during the season (all during the Chase) while Edwards had only one win in the third race of the season). 2011 saw 5 drivers win their 1st ever Sprint Cup race (Trevor Bayne, Regan Smith, David Ragan, Paul Menard, and Marcos Ambrose). 2011 also saw 19 different drivers winning at least one race. 2011 matched 2001 with both modern era record accomplishments. (key) Bold – Pole position awarded by time. Italics – Pole position set by final practice results. * – Most laps led. ^ "Brad Keselowski To Pilot Blue Deuce Starting In 2011 | Brad Keselowski Racing". Bradracing.com. April 1, 2010. Archived from the original on January 22, 2011. Retrieved January 24, 2011. ^ "Hendrick Motorsports shuffles crew chiefs for three teams". USA Today. November 24, 2010. Retrieved January 24, 2011. ^ Team Release (January 7, 2011). "Texans partner to form new race team — Jan 7, 2011". Nascar.Com. Retrieved February 5, 2011. ^ "News > Frank Stoddard forms new team". Motorsport.com. January 19, 2011. Retrieved February 5, 2011. ^ "David Stremme Returning to NASCAR Sprint Cup Series". Inception Motorsports. April 30, 2011. Archived from the original on April 2, 2011. Retrieved July 10, 2011. ^ Release, Team (August 11, 2010). "RCR signs Menard, returns to four-car stable". NASCAR. Archived from the original on August 15, 2010. Retrieved August 23, 2010. ^ Release, Team (August 10, 2010). "Kahne to drive for Red Bull Racing Team in 2011". NASCAR. Archived from the original on September 12, 2010. Retrieved October 16, 2010. ^ Release, Team (August 17, 2010). "Ambrose signs with Richard Petty Motorsports". NASCAR. Archived from the original on September 14, 2010. Retrieved October 16, 2010. ^ Release, Team (July 28, 2010). "Labonte to drive for JTG Daugherty in 2011". NASCAR. Archived from the original on September 14, 2010. Retrieved October 17, 2010. ^ "Lee Spencer: Bill Elliott to drive for Phoenix Racing in NASCAR Sprint Cup Series – NASCAR News | FOX Sports on MSN". Msn.foxsports.com. January 17, 2011. Archived from the original on February 10, 2011. Retrieved January 21, 2011. ^ "Kevin Conway to drive for Nemco Motorsports at Daytona | NASCAR News Now". SceneDaily.com. Retrieved January 26, 2011. ^ "Bayne Joins Wood Brothers For 17 Races". inRacingNews.com. Archived from the original on January 23, 2011. Retrieved January 21, 2011. ^ a b Post a Comment. "Opportunity is now for underdog Brian Keselowski in Daytona 500 | NASCAR News Now". SceneDaily.com. Retrieved February 19, 2011. ^ "Elliott Sadler to drive for Kevin Harvick Inc. in Nationwide Series in 2011 – NASCAR News | FOX Sports on MSN". Msn.foxsports.com. November 5, 2010. Retrieved January 18, 2011. ^ "Roger Penske: Sam Hornish has NASCAR ride for 2011 – NASCAR News | FOX Sports on MSN". Msn.foxsports.com. Archived from the original on January 21, 2011. Retrieved January 18, 2011. ^ "Scott Speed released from Red Bull Racing – NASCAR". Sporting News. December 2, 2010. Archived from the original on January 3, 2011. Retrieved February 8, 2011. ^ "Scott Speed files $6.5 million lawsuit against Red Bull Racing | NASCAR News Now". SceneDaily.com. Retrieved February 8, 2011. ^ Sporting News Wire Service (July 26, 2011). "Notebook: Speed gets ride for Brickyard 400". Nascar.com. Retrieved July 28, 2011. ^ Reid Spencer (February 10, 2011). "Bayne will have to postpone Cup rookie run – NASCAR". Sporting News. Retrieved February 19, 2011. ^ "NASCAR to eliminate catch cans for 2011 in all series | NASCAR News Now". SceneDaily.com. October 9, 2010. Archived from the original on January 7, 2011. Retrieved December 6, 2010. ^ Rodman, Dave (January 11, 2011). "NASCAR drivers must elect championships in '11". NASCAR.com. Archived from the original on January 12, 2011. Retrieved January 11, 2011. ^ Network, Sports. "NASCAR adopts new points system, changes format for Chase | Auto Racing". Lexington Herald-Leader. Retrieved January 27, 2011. ^ Utter, Jim. "Will NASCAR's new points add up with fans?". www.thatsracin.com. Archived from the original on January 30, 2011. Retrieved January 27, 2011. ^ "Changes for 2011 include emphasis on winning – Jan 26, 2011" (Press release). NASCAR. January 26, 2011. Retrieved January 27, 2011. ^ "NASCAR points system changes to add more excitement to MIS events". Catchfence. January 26, 2009. Retrieved January 27, 2011. ^ "NASCAR chairman Brian France announces new points system – ESPN". ESPN. January 1, 2008. Retrieved January 27, 2011. ^ Post a Comment (October 12, 2010). "Teams already working on cars with new 2011 front splitter | NASCAR News Now". SceneDaily.com. Retrieved January 24, 2011. ^ "NASCAR going green; E15 fuel next season". Speedwaymedia.com. October 16, 2010. Archived from the original on September 27, 2011. Retrieved December 7, 2010. ^ Release, Official (August 18, 2010). "2011 NASCAR Schedule". NASCAR. Archived from the original on August 22, 2010. Retrieved August 23, 2010. ^ "2011 Schedule". Jayski.com. Archived from the original on August 8, 2010. Retrieved August 7, 2010. ^ Hammond, Jeff (August 19, 2010). "New NASCAR Sprint Cup schedule offers dramatic possibilities". Fox Sports. Archived from the original on August 23, 2010. Retrieved August 21, 2010. ^ a b "Phoenix receives second race on 2011 schedule". NASCAR. Archived from the original on August 15, 2010. Retrieved August 10, 2010. ^ "Atlanta to play host to one race weekend in 2011". NASCAR. Archived from the original on August 18, 2010. Retrieved August 7, 2010. ^ "Auto Club Speedway race changed from 500 miles to 400 miles | NASCAR News Now". SceneDaily.com. Retrieved January 13, 2011. ^ "AP: Kansas to get second NASCAR Sprint Cup race". USA Today. August 6, 2010. Retrieved August 10, 2010. ^ "Finally, Kentucky gets its long-awaited Cup date". NASCAR. Archived from the original on August 15, 2010. Retrieved August 10, 2010. ^ "Chicago gets first Chase race of 2011". ESPN. Retrieved August 10, 2010. ^ Sporting News Wire Service. "Chase race start times adjusted for 2011 season – Jan 27, 2011". Nascar.Com. Archived from the original on January 28, 2011. Retrieved January 28, 2011. ^ Dave Rodman, NASCAR.COM. "NASCAR reducing restrictor plate for Daytona test — Jan 13, 2011". Nascar.Com. Retrieved January 13, 2011. ^ Official Release (October 9, 2010). "Preseason Thunder dates set for Jan. 20–22". NASCAR. Archived from the original on October 13, 2010. Retrieved October 9, 2010. ^ "NASCAR – CUP: Bowyer Has Fastest Test-Session Speed". Nascar.speedtv.com. Archived from the original on March 17, 2012. Retrieved January 21, 2011. ^ "Speeds down, track extremely smooth as Clint Bowyer leads first test session at Daytona | NASCAR News Now". SceneDaily.com. Retrieved January 21, 2011. ^ "2011 NSCS NASCAR Preseason Thunder Day 1 – Afternoon Drafting Session Speeds". Catchfence. Retrieved January 21, 2011. ^ a b "Teams work on two-car draft at Daytona during second day of testing | NASCAR News Now". SceneDaily.com. Retrieved January 22, 2011. ^ "NASCAR — CUP: Logano, Hamlin Cross 197 Barrier At Daytona". Nascar.speedtv.com. Archived from the original on March 17, 2012. Retrieved January 22, 2011. ^ "Two-car drafts dominate final day of Thunder — Jan 22, 2011". Nascar.Com. January 22, 2011. Retrieved January 23, 2011. ^ Dave Rodman, NASCAR.COM. "Officials not worried about speeds at Thunder — Jan 23, 2011". Nascar.Com. Retrieved January 24, 2011. ^ Sporting News Wire Service (February 13, 2011). "Busch wins Shootout as Hamlin black-flagged – Feb 13, 2011". Nascar.Com. Retrieved February 19, 2011. ^ a b Caraviello, David. "Ragan's mistake dooms chance at Daytona victory". Nascar.Com. Retrieved February 21, 2011. ^ "Jeff Gordon wins at Phoenix to snap 66-race drought – ESPN". ESPN. February 28, 2011. Archived from the original on June 29, 2011. Retrieved July 10, 2011. ^ "Edwards's pit strategy, Stewart's pit error equal win at Vegas Read more: Garner News – Edwards's pit strategy Stewart s pit error equal win at Vegas". Garnernews.net. Archived from the original on July 23, 2011. Retrieved July 10, 2011. ^ Sporting News Wire Service (March 21, 2011). "Busch's Bristol roll continues with Cup victory – Mar 21, 2011". Nascar.Com. Retrieved July 10, 2011. ^ "Thrilling Home Win for Kevin Harvick". MotorRacingNetwork.com. March 27, 2011. Archived from the original on June 14, 2012. Retrieved July 10, 2011. ^ Sporting News Wire Service. "Harvick edges past Earnhardt for Martinsville win – Apr 4, 2011". Nascar.Com. Retrieved July 10, 2011. ^ Sporting News Wire Service (April 11, 2011). "Kenseth snaps long drought in easy Texas victory – Apr 11, 2011". Nascar.Com. Retrieved July 10, 2011. ^ "Jimmie Johnson takes Talladega in tie for closest Sprint Cup victory – ESPN". ESPN. April 18, 2011. Retrieved July 10, 2011. ^ Sporting News Wire Service (May 2, 2011). "Busch springs to another victory at Richmond – May 2, 2011". Nascar.Com. Archived from the original on June 29, 2011. Retrieved July 10, 2011. ^ . "Regan Smith survives at Darlington Raceway". Charlotte.news14.com. Archived from the original on March 23, 2012. Retrieved July 10, 2011. ^ Sporting News Wire Service (May 16, 2011). "Latecomer Kenseth steals a victory at Dover". Nascar.com. Retrieved July 10, 2011. ^ Ryan, Nate (May 21, 2011). "Ragan, Keselowski, Earnhardt Jr. advance to all-star race". Concord, North Carolina. USA Today. Retrieved July 28, 2011. ^ Ryan, Nate (May 21, 2011). "Carl Edwards breezes to first victory in Sprint All-Star Race". Concord, North Carolina. USA Today. Retrieved July 28, 2011. ^ Hembree, Mike (May 29, 2011). "NASCAR – CUP: Harvick Wins Charlotte In Bizarre Finish". Speedtv.com. Archived from the original on July 24, 2011. Retrieved July 28, 2011. ^ "Kevin Harvick Wins Coke Cola 600 – Longest NASCAR Race Ever – Crazy Finish". Racing News Digest. Racing News Digest. 2011-05-29. Archived from the original on November 1, 2011. Retrieved 2011-10-30. ^ Associated Press (June 6, 2011). "Brad Keselowski wins at Kansas". ESPN. Retrieved July 28, 2011. ^ Hembree, Mike (June 12, 2011). "UP: Jeff Gordon Smokes Field At Pocono". Speedtv.com. Archived from the original on October 4, 2011. Retrieved July 28, 2011. ^ Sporting News Wire Service (June 20, 2011). "Hamlin holds off Kenseth for win at Michigan". Nascar.com. Archived from the original on June 29, 2011. Retrieved July 28, 2011. ^ "Busch Takes Road to Victory". Motorracingnetwork.com. June 26, 2011. Archived from the original on August 7, 2011. Retrieved July 28, 2011. ^ Ryan, Nate (July 2, 2011). "David Ragan wins at Daytona for first Sprint Cup victory". Daytona Beach, Florida. USA Today. Retrieved July 28, 2011. ^ Ryan, Nate (July 9, 2011). "Kyle Busch wins inaugural Sprint Cup race at Kentucky". Sparta, Kentucky. USA Today. Retrieved July 28, 2011. ^ Sporting News Wire Service (July 18, 2011). "Newman, Stewart run 1–2 at New Hampshire". Nascar.com. Retrieved July 28, 2011. ^ "Busch wins 33rd annual Budweiser Shootout". Daytona International Speedway. February 13, 2011. Retrieved February 19, 2011. ^ "Bayne, Wood Brothers Capture 53rd annual Daytona 500". Daytona International Speedway. February 20, 2011. Retrieved February 21, 2011. ^ "2011 Daytona 500 results". Nascar.Com. February 20, 2011. Archived from the original on June 28, 2011. Retrieved July 10, 2011. ^ "2011 Subway Fresh Fit 500 results". Nascar.Com. February 27, 2011. Archived from the original on June 28, 2011. Retrieved July 10, 2011. ^ "2011 Kobalt Tools 400 results". Nascar.Com. March 6, 2011. Archived from the original on June 28, 2011. Retrieved July 10, 2011. ^ "2011 Jeff Byrd 500 presented by Food City results". Nascar.Com. March 20, 2011. Retrieved July 10, 2011. ^ "2011 Auto Club 500 results". Nascar.Com. March 27, 2011. Retrieved July 10, 2011. ^ "2011 Goody's Fast Relief 500 results". Nascar.Com. April 3, 2011. Retrieved July 10, 2011. ^ "2011 Samsung Mobile 500 results". Nascar.Com. April 9, 2011. Retrieved July 10, 2011. ^ "2011 Aaron's 499 results". Nascar.Com. April 17, 2011. Retrieved July 10, 2011. ^ "2011Crown Royal Presents the Matthew and Daniel Hansen 400". Nascar.Com. April 30, 2011. Retrieved July 10, 2011. ^ "2011 Showtime Southern 500 results". Nascar.Com. May 7, 2011. Retrieved July 10, 2011. ^ "2011 FedEx400 benefiting Autism Speaks results". Nascar.Com. May 15, 2011. Retrieved July 10, 2011. ^ "2011 Coca-Cola 600 results". Nascar.Com. May 29, 2011. Retrieved July 10, 2011. ^ "2011 STP 400 results". Nascar.Com. June 5, 2011. Retrieved July 10, 2011. ^ "2011 5-hour Energy 500 results". Nascar.Com. June 12, 2011. Retrieved July 10, 2011. ^ "2011 Heluva Good! Sour Cream Dips 400 results". Nascar.Com. June 19, 2011. Retrieved July 25, 2011. ^ "2011 Toyota/Save Mart 350 results". Nascar.Com. June 26, 2011. Retrieved July 25, 2011. ^ "2011 Coke Zero 400 powered by Coca-Cola results". Nascar.Com. July 2, 2011. Retrieved July 25, 2011. ^ "2011 Quaker State 400 results". Nascar.Com. July 9, 2011. Retrieved July 25, 2011. ^ "2011 Lenox Industrial Tools 301 results". Nascar.Com. July 17, 2011. Retrieved July 25, 2011. ^ "2011 Brickyard 400 results". NASCAR.com. Turner Sports. July 31, 2011. Retrieved August 1, 2011. ^ "2011 Good Sam RV Insurance 500 results". NASCAR.com. Turner Sports. August 7, 2011. Retrieved August 8, 2011. ^ "2011 Heluva Good! Sour Cream Dips at the Glen results". NASCAR.com. Turner Sports. August 15, 2011. Retrieved August 28, 2011. ^ "2011 Pure Michigan 400 results". NASCAR.com. Turner Sports. August 21, 2011. Retrieved August 28, 2011. ^ "2011 Irwin Tools Night Race results". NASCAR.com. Turner Sports. August 27, 2011. Retrieved August 28, 2011. ^ "2011 AdvoCare 500 results". NASCAR.com. Turner Sports. September 6, 2011. Retrieved September 6, 2011. ^ "2011 Wonderful Pistachios 400 results". NASCAR.com. Turner Sports. September 10, 2011. Retrieved September 10, 2011. ^ "2011 Geico 400 results". NASCAR.com. Turner Sports. September 19, 2011. Retrieved September 19, 2011. ^ "2011 Sylvania 300 results". NASCAR.com. Turner Sports. September 25, 2011. Retrieved September 25, 2011. ^ "2011 AAA 400 results". NASCAR.com. Turner Sports. October 2, 2011. Retrieved October 3, 2011. ^ "2011 Hollywood Casino 400 results". NASCAR.com. Turner Sports. October 9, 2011. Retrieved October 9, 2011. ^ "2011 Bank of America 500 results". NASCAR.com. Turner Sports. October 15, 2011. Retrieved October 18, 2011. ^ "2011 Good Sam Club 500 results". NASCAR.com. Turner Sports. October 23, 2011. Retrieved October 24, 2011. ^ "2011 Tums Fast Relief 500 results". NASCAR.com. Turner Sports. October 30, 2011. Retrieved October 30, 2011. ^ "2011 AAA Texas 500 results". NASCAR.com. Turner Sports. November 6, 2011. Retrieved November 7, 2011. ^ "2011 Kobalt Tools 500 results". NASCAR.com. Turner Sports. November 13, 2011. Retrieved November 14, 2011. ^ "2011 Ford 400 results". NASCAR.com. Turner Sports. November 20, 2011. Retrieved November 21, 2011. ^ "2011 Official Driver Standings". NASCAR.com. Turner Sports. Retrieved November 21, 2011. ^ "Manufacturer Standings". NASCAR.com. Turner Sports. Retrieved November 21, 2011.